I ran across an extremely interesting website that deals with improving New York City but it could apply to any city anywhere. The site belongs to Candy Chang and it highlights several social experiments aimed at improving the city and bringing the people involved closer to their communities as a whole as well as to one another. I highly recommend a visit to the site and a browse through all of her projects. 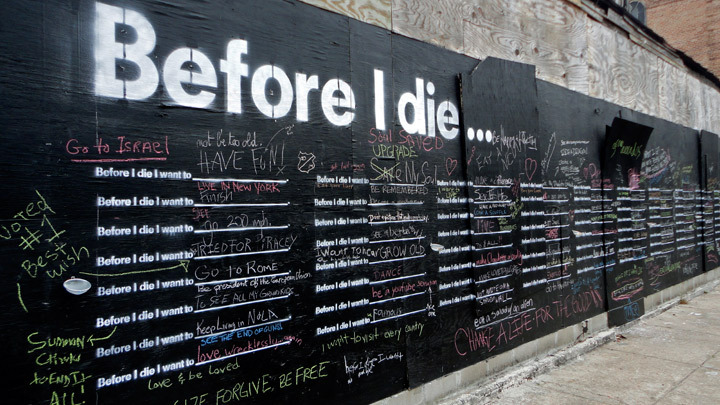 One example is called “Before I Die.” One wall of an abandoned building was cleared to make way for chalk boards. Anyone passing by could grab a piece of chalk and fill in a blank describing what they would like to do before they die. This seems like a simple and pointless thing to do. A waste of money spent on chalk and chalk boards, not to mention the time it took for someone to put it all into place. In reality, the passers by found a psychological connection to those who had left their mark before them. Strangers on the street suddenly become “people” with feelings, hopes, dreams and real emotion. At the same time, this landmark building becomes a symbol of a community that cares about the hopes and dreams of those who live or work in the area. This was absolutely an amazing idea. There was so much more to this project and you can read about it and see more photos on Candy Chang’s site. Another really neat idea was based on the amount of time that city dwellers spend walking from one place to another inside the city. Anyone who has used walking as their mode of transportation, knows that “walking time” is “thinking time.” So, while you are walking, instead of thinking of your grocery list or that huge pile of laundry you have to get to at some point, why not work on your mental state? 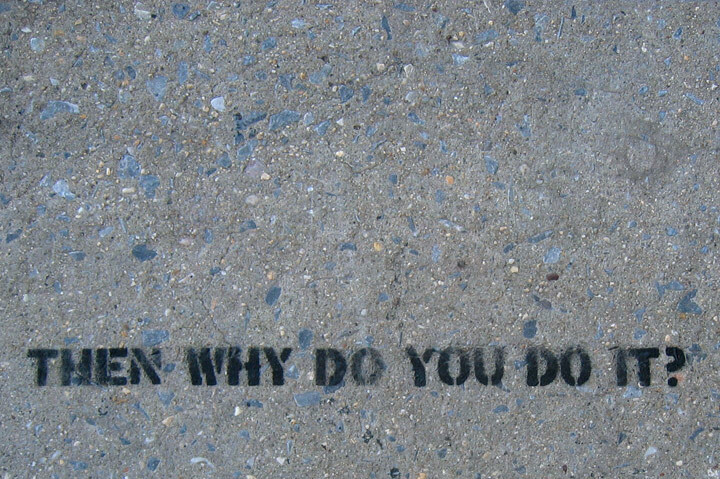 That’s right, “Sidewalk Psychiatry!” This is nothing more than a few very broad questions stenciled onto city sidewalks designed to make people think about themselves and examine their own lives. Just think of how many life problems can be solved on a ten block walk if only you had been asked a question that brought you back to that subject and really made you think about it. There are tons of other interesting projects on her site like the “I Wish This Was” stickers that were given out at no charge and people filled in the blanks and stuck them to something that needed an upgrade of some sort. An empty shop was labeled with types of businesses the community wanted and needed for example. Another project used sticky notes to anonymously get information about the amount of rent paid in different areas of the city. You fill in the number of bedrooms, the community name, how long you’ve lived there and how much rent you pay without signing your name to it.